I’ve always been fascinated – more like surprised – by the use of mice in media, advertising and pop culture. Most of us detest mice, and have little tolerance for them anywhere. Yes, I know some have them as pets, but for most people I suspect they’re filthy, disgusting and a nuisance. They harm plants and crops, can cause house damage and spread diseases with their feces. Yet we have a culture that turns them into fun-loving, adorable creatures – and we love them! Think about the cute mice from various movies: “Stuart Little,” “Charlotte’s Web,” “An American Tale,” “Shrek,” “Ratatouille” (I know they’re rats, but still). 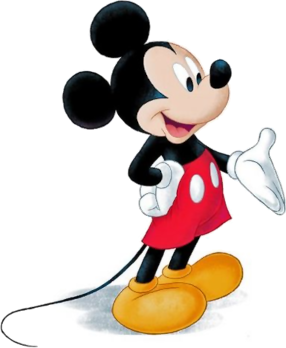 Of course, we can’t forget that black and white mouse upon which an empire-like movie, music and entertainment industry like no other is based. It’s fascinating how in real life we’ll do anything to chase and destroy them, yet elsewhere we find them charming and sweet, often heroic. It’s impressive how the entertainment world has found a way to make us love something we should dislike. And now, we have a mouse from the marketing and advertising world who has entered into rare territory, a realm only occupied by radical parent segregationists like Jif, Kix, Boppy and Gerber. Take a look at this doozy of a commercial, which doesn’t hide a thing about to whom it’s speaking. I love how the first time Chuck E. Cheese’s decides to let dad have some air time (halfway through the ad), he’s slightly fuzzy and unclear in the background. It’s like the play place chain is reluctantly acknowledging dad’s existence because it has to, but doesn’t actually want to give him much recognition. In fact, the ad really doesn’t ever let us see the front of dad once. The only time he’s truly center stage (which is a stretch because he’s huddled behind his family) is at the cash register – when it’s time to pay – because dads are merely the providers, right Chuck E. Cheese’s? They’re not nurturers, they didn’t set up the fun day at the restaurant, and they certainly aren’t real parents, or you would have acknowledged them. Every kid in the ad validates this, including one with a big, warm hug – only for mom. Just in case my perceptive visual sensibilities are askew, where the possibility always exists that I’m off base on what my eyes see, there’s no mistaking how many times the ad utters the word mom: five. 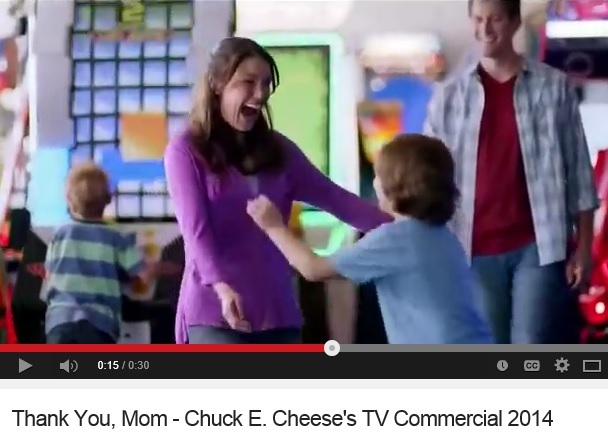 Stop me if I’m wrong, Chuck E. Cheese’s, but from my perspective, the commercial is about as dad exclusionary as it gets. If this was some kind of Mother’s Day ad, that’s great, but it hardly indicates as such. 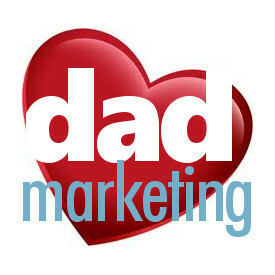 Further botching its lopsided marketing message is the completely out-of-place, mismatched tagline which seems to want it both ways when it exclaims, Where Awesome Parents Go. Talk about disconnect, the commercial’s one true consistent theme. There are plenty of warm and engaging mice characters out there, but this ad makes the Chuck E. Cheese’s mascot look like what it really is: a vile rodent.